I really was not planning to do any Christmas decorations, other than the wreath this year, but I was feeling a little bah humbug. I will be here until a couple of days before Christmas, and it is nice to have just a little bit of holiday cheer. 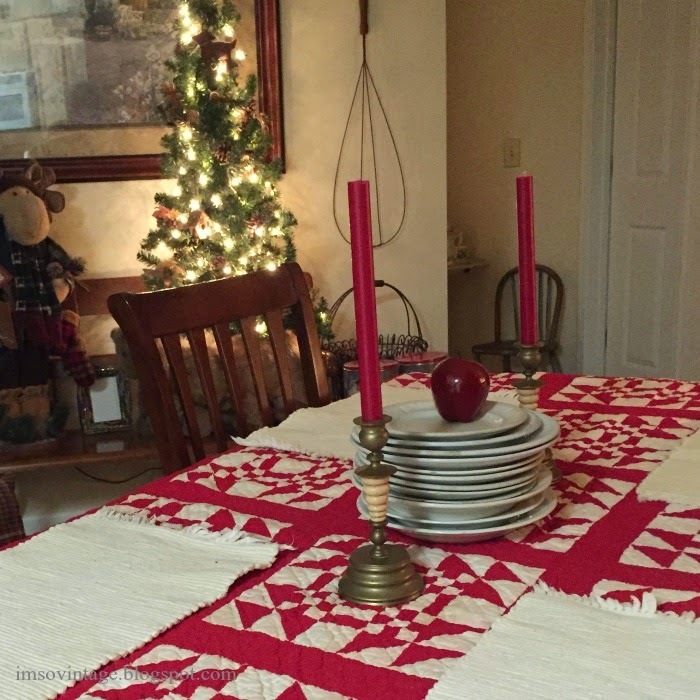 Out came my grandmother's Christmas quilt to be used as a tablecloth. I topped it with some place mats to keep it clean. 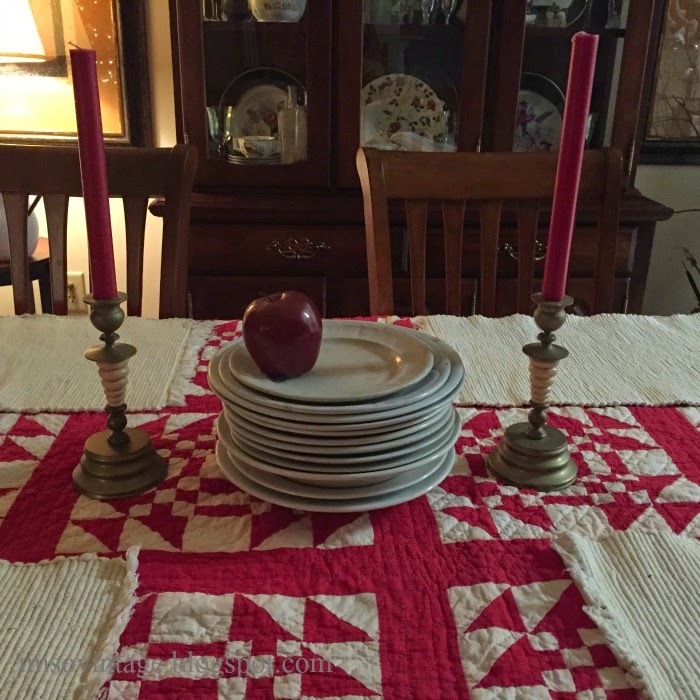 so I added a stack of antique white ironstone plates, an apple, and two vintage brass candlesticks. I love the sculptural look of the plates. Here's a view looking across the table in the other direction. You can see the one small Christmas tree that I put up. I'll try to get some better pictures of it. It was five in the morning when I took these. We were having a torrential downpour, and I woke up at four to a steady clink, clink, clink, which sounded like it was in my room. I didn't even want to turn on the light to see what was going on. Turns out one of the windows in my bedroom was leaking. That will have to be taken care of on Monday. Update on Katy. I spoke with her for about an hour last night. 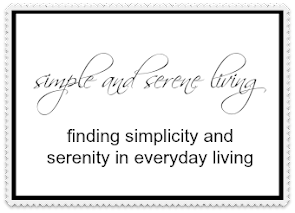 She said she had finally been moved out of purgatory and into a beautiful private room with lots of light. Apparently they had been keeping her for two days in an area that patients are supposed to stay in for no more than a few hours between the time they leave the ER and are moved to a room. I won't even describe what she told me, but needless to say there will be a very large complaint made to Emory University Hospital. Of course, they didn't tell me any of this until it was over, because they know that sick or not I would have been in my car and driving like a crazy woman to get down there and protect my baby. Thank goodness she is getting wonderful care now. She is still in very bad pain, but her New York doctor is taking the lead on her care. Monday they will be doing a Pet Scan. Thank you so much for your continued prayers. They mean the world to me. for. Now I am ready for the Ladies' meeting, something I haven't been excited about in several years. 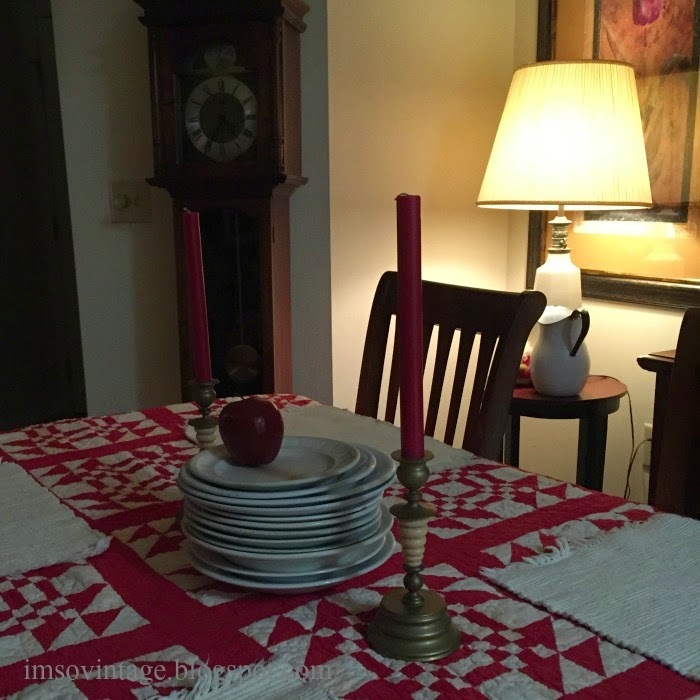 I love your red and white quilt being used as a tablecloth! We've been having rain here all day too. I'm surprised she isn't receiving better care at Emory. I have always heard that is such a great hospital. I'm so sorry that she is having problems right now. Glad to hear that she's in a better room now. What gorgeous quilt! Nothing beats red and white does it! I'm enjoying my little tree loaded with ornaments right now! So glad to hear your daughter is doing better. When do you arrive for Christmas? I know you will be anxious to see your family here in GA! Get better soon! So pretty!! Love the quilt. Hope your daughter continues to improve! Your girl is strong like her mother! I LOVE that quilt! Red and white make for a very traditional and cosy Christmas. I hope the next news about your daughter will be good ones!